I think the festive season is the time of year when even people who rarely paint their nails decide that they want to wear pretty, sparkly shades on their finger tips. As you've probably guessed I'm a big fan of nail varnish (although my collection is small compared to some I've seen!) so I thought I would pick out a few shades that say Christmas to me and a few that may not be traditional Christmas colours but that are really pretty for this time of year. 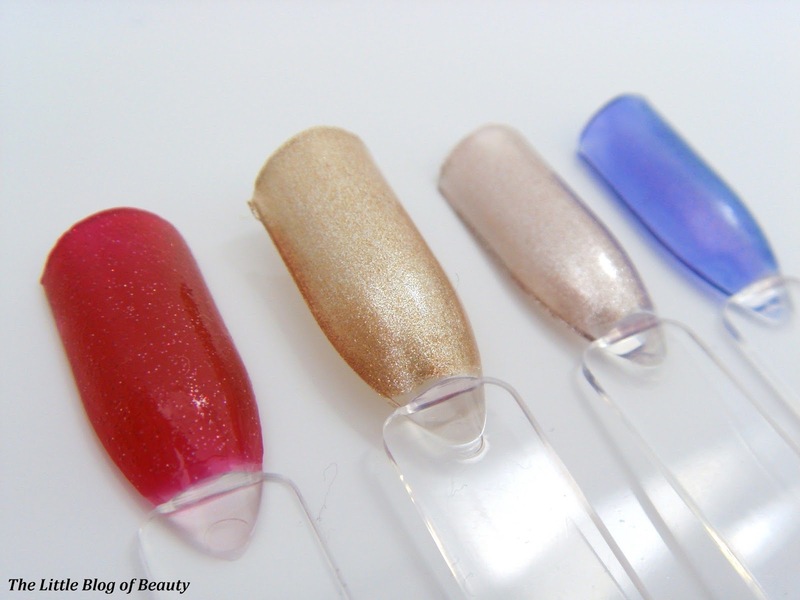 Although I love the way glitter looks on nails, I'm really not a fan of trying to remove it, so I haven't included any glitter shades, but it is safe to say my top picks are all shimmery and sparkling. 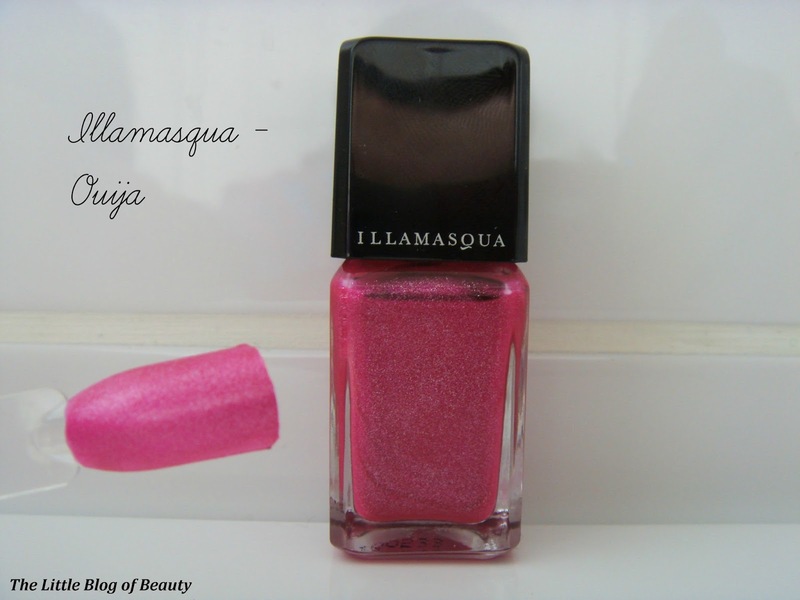 Several of my festive picks came from one of two brands and one of these brands was Illamasqua. 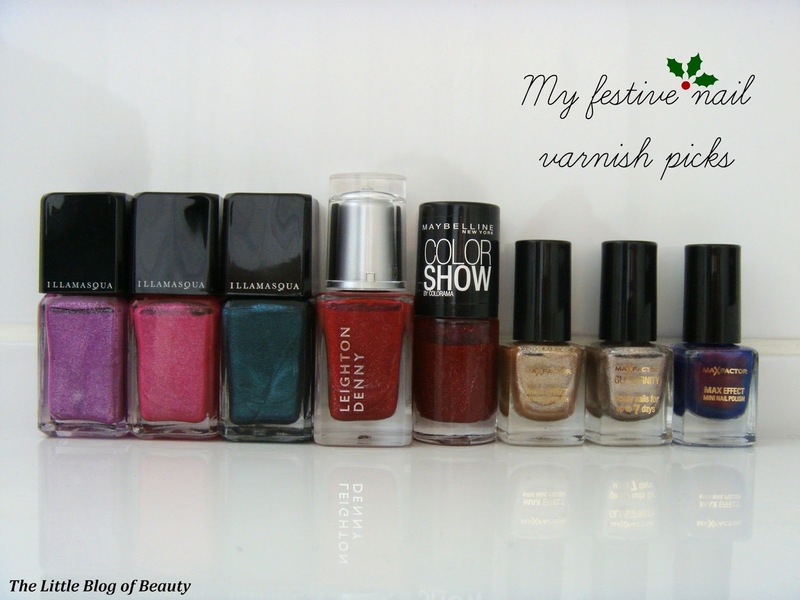 I love Illamasqua's nail varnishes as they're such good quality and they have some amazing shades. My first festive choice is Seance, which is part of the Paranormal collection. Purple is one of my favourite colours and the very fine shimmer that runs through this makes it an incredible shade. Purple may not be a traditional Christmas shade but I think the shimmer in this makes it quite Christmasy and I did use this as the 'wrapping paper' for the Christmas nail art I posted recently. 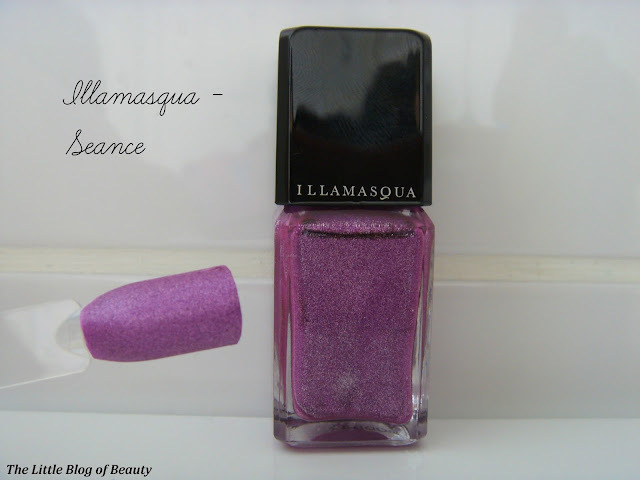 Ouija is also from Illamasqua's Paranormal collection and is exactly the same as Seance but is a pink shade. This shade would also be perfect to use as wrapping paper for my gift wrapped nails look. 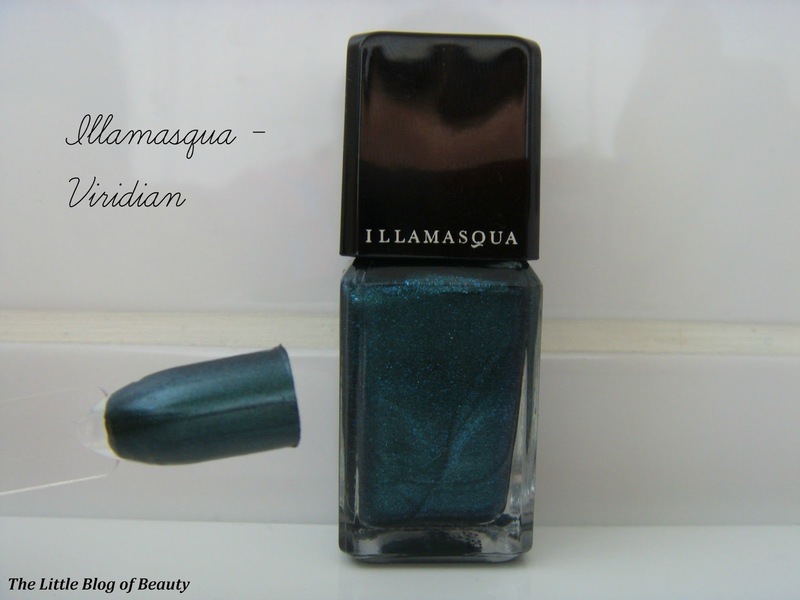 My final Illamasqua pick is Veridian. Although I'm not a fan of green shades at all, when I picked this one up it immediately made me think of Christmas trees or the leaves of mistletoe and green is traditionally a festive shade. It may be slightly too dark to use as a Christmas tree or mistletoe but I may try some nail art using this one. In most cases I only picked one example of a particular colour but for my red shade I included two different varnishes as although they're both red shimmers they're quite different. The first of these is Leighton Denny's Bestseller, which I actually won in a Christmas competition last year. 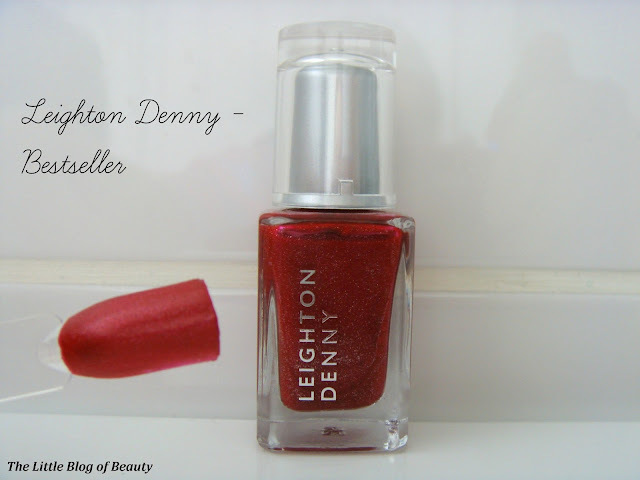 This is a classic red with silver and red shimmer running through it. 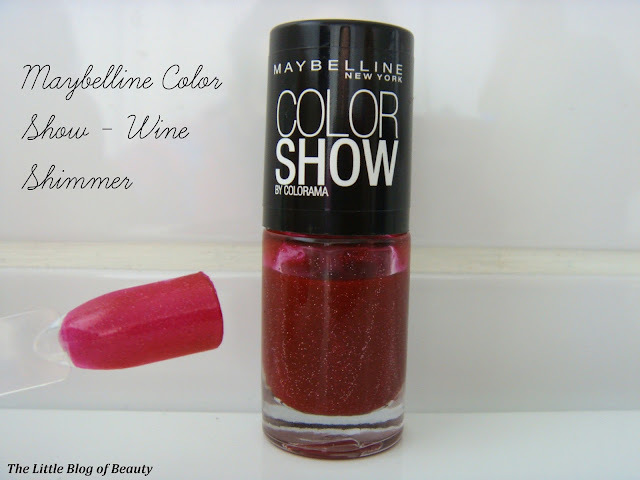 In contrast Maybelline's Wine Shimmer is a slightly darker shade of red which also contains multi-coloured shimmer that reflects as red, silver, blue and green in different light. Whereas Bestseller is a 'thick' opaque colour Wine Shimmer is a sheerer colour that really lets the shimmer show up more. My last three festive nail varnish picks are all mini nail varnishes from Max Factor (I believe these should also all be available in full sizes as well). I think gold and silver are both very festive shades so I've included one of each. I'm slightly confused by the first Max Factor shade I've included because even though it's a shimmery gold shade it's called Ivory? I would have thought Ivory would be a kind of off white creamy colour, but maybe I'm wrong. I'm not usually into gold anything, including jewellery, but this looks so amazing on your nails, especially this time of year. It's quite a subtle colour but when it catches the light it really sparkles and looks so pretty. 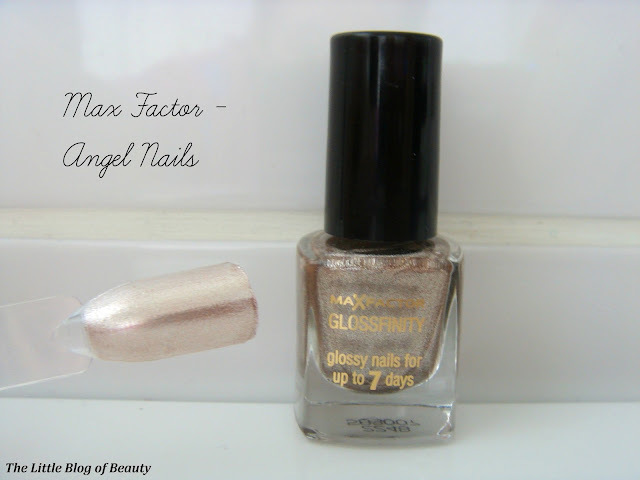 My second Max Factor pick is Angel Nails, which is very similar to Ivory but is more of a silver shade or possibly a lighter gold shade, it's quite difficult to tell. This is just as pretty as Ivory, subtle but with a lovely sparkle in the light. 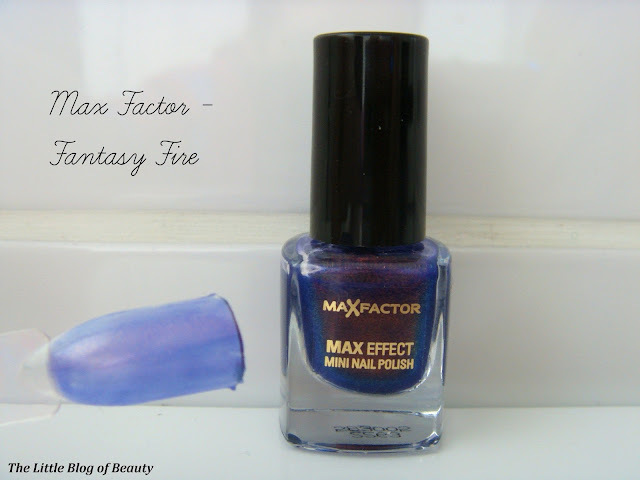 My final Max Factor and festive pick is Fantasy Fire, which is a very unusual shade. This is a purple shade with a red shimmer running through it. Fantasy Fire is the perfect name for this shade as when the light catches the red shimmer it does kind of look like fire, but not natural fire! Unfortunately this shade really does not transfer well onto a practice nail, as you can see above, and is virtually impossible to photograph accurately. The colour is darker and more purple and the effect of the red shimmer does not show on camera. As you can see this is a very thin colour but this does work really well on your nails. You can easily wear this on it's but you may also want to wear a base colour underneath to make it more visible. 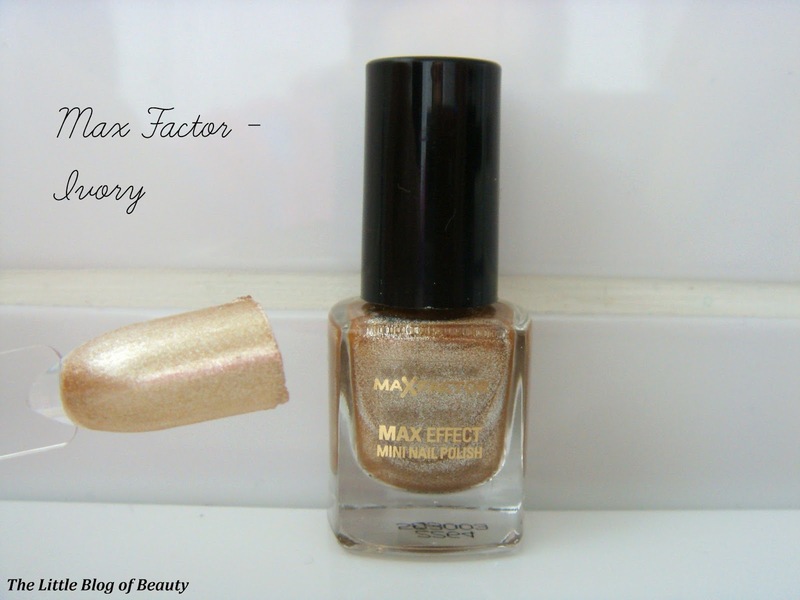 I love the Max Factor nail polishes but i don't have the Ivory colour. I'll have to pick that up. I literally can't pick a favourite out of these!! © The Little Blog of Beauty. Powered by Blogger. © The Little Blog of Beauty. All rights reserved.